Legendary blues guitarist B.B. 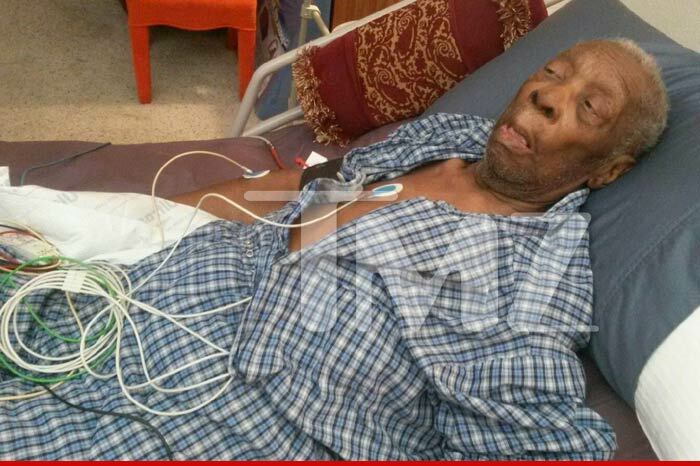 King has been hospitalized amid claims of elderly abuse. According to TMZ, his daughter, Patty King, and the legend’s longtime manager Laverne Toney, have been battling over whether or not he should be hospitalized. Patty, who lives with her father in Las Vegas, told TMZ she wanted to take him to the doctor because his urine was orange and he wasn’t eating. King’s daughter also claims that Toney, who has power of attorney over B.B., refused to take him to the clinic. B.B. was transported to a local hospital after police were called. The 89-year-old was treated — and Patty says he suffered a minor heart attack. She took the below photo of her father during his stay at the hospital in hopes of convincing authorities to do something to protect him. Last November, Patty King and her boyfriend filed a police report claiming elder abuse and burglary. They accused Toney and her assistant of stealing $20-$30 million from B.B., withholding his medications while on tour and stealing $250,000 worth of jewelry from the blues singer. Police investigated and no charges were filed. Patty King is currently meeting with lawyers to take power of attorney from Toney away.